Every month, we deliver new information about cloth diapers straight to your inbox! Thanks so much for signing up! This year, I've sworn that I'm going to be more organized when it comes to Christmas! We're also traveling to see family this year, the first Christmas trip we've made since my little boy was born. That means I'll definitely have to be more organized! How about you, how do you celebrate the holidays? Do you travel or stay home? The holiday season is often a great time to get together with friends and family. While it can take a bit more planning (and yes, courage!) you really can rely on cloth even while traveling. While some cloth diapering mommies are more purist in their approach to diapering than others, please believe me when I say that it's okay to use disposables! There are definitely times when convenience outweighs costs, environmental concerns, and even comfort! So in your internal debate, please keep in mind that it's only your own pride and beliefs that you need to manage if you decide to use disposables when you're out and about. Once you get used to using cloth, traveling with cloth diapers won't seem so scary. The main difference is that instead of leaving your dirty diapers behind in someone else's trash, you'll have to carry them home with you. Planning for it will make all the difference! As far as diaper styles go, anything goes! That said, packing hybrids, all-in-twos, and prefolds is sometimes a bit more efficient - you don't need as much bulk since you can re-use the covers if they're not soiled! Tip: bring an extra wet bag if you have one. If not, throw in a large ziploc bag, or even a plastic grocery bag. Disposable inserts (our favorite is the fully compostable g-Diaper insert, which we've tucked into just about every shell and pocket we own!) are also an option. It doesn't matter what the package says... If you decide to use disposable inserts inside of cloth shells, don't try to flush them down someone else's toilet. Their plumbing may not be quite as good as yours, or they might be on septic. Who knows - but if you don't know, don't wear out your welcome! Dump off solids, and then throw them in the garbage. If your friends are green-minded (and don't have weak stomachs or overactive imaginations), ask if they would mind if you put them (wet-only!) in their compost bin! Are you using cloth wipes yet? Do you love them? You don't have to leave them at home! We often travel with cloth wipes. They make clean-up much easier, they're so much softer on your baby's bum (or hands! ), and they don't have to be sorted out of cloth diapers. If you want to travel with cloth wipes, buy a small wet bag, and tuck some cloth washcloths inside. Add a small amount of water, and tuck them inside your diaper bag. If you're going for longer than a day, you can always pack extra dry cloths in your bag and use them to restock your wet wipe stash later! The perfect diaper bag? Last year, we highlighted some recommendations for cloth diaper-friendly bags and totes that are big enough to haul all your cloth diaper essentials. Since the article is almost a year old, I would love it if you could flip me a note if you have any other suggestions we should add to the list! Pack 1 to 2 more diapers than you think you'll need. Keep an extra diaper in the car. The best plan is either a disposable (please see my note above about this being a choice YOU make) or a one-size cover and prefolds (Believe me, it's easy to forget about it after a few months when you should have re-stocked with the next size up!) We like to travel prepared: we usually have extra pyjamas and at least one extra diaper in the car for emergencies - and for those impromptu stop-overs with friends that turn into a whole-day affair! For air travel, luggage restrictions can be a challenge. If you plan to bring your cloth diapers, you will want to bring your own detergent too. Make sure your host doesn't use dryer sheets, which can coat your diapers, even if you don't use dryer sheets in your cloth diaper load. Also, be aware that water types can vary across the country - you may need to strip your diapers if necessary after the trip. Consider taking along some disposable inserts (we love G-Diaper inserts, which we found to be far more absorbent than Flip inserts). Just for our newsletter subscribers: We welcomed a new advertiser,Diva Diapers, this month! Carolann has offered 10% off all orders until the end of November with code thinkcloth. Need a Christmas gift idea for a teacher or special friend? Eco Parent Magazine might be just the thing! Until December 31, our readers can save 20% off with code thinkingaboutcloth. NEW! Deal of the Week! Check out the Black Friday Specials at Diaper Junction!$50 in free diapers and products on orders over $79, plus $6 Thirsties covers, and lots of other great savings, too! Like this? You can subscribe to our weekly cloth diaper sales round-up to get deals just like this one delivered to your in-box every week (sign-up form at bottom of the article). Appalachia Diaper Drive: hosted by Leettle Baby Blog, this fundraiser and giveaway event is raising funds and awareness for this cloth diapering program based in Kentucky. Faced with higher rates of poverty than much of the US, Tomahawk Sustainment Mission is working to establish cloth diapers as an economic alternative for strugging families. Looking for somewhere to donate to this holiday season? Check out this worthwhile US-based cause! Visit the auction page here. Over at the end of November. Wrapping up our Choose Your Charity Event in October, we've donated $300 to Ribbon and Stitches, and $50 to Giving Diapers, Giving Hope. We're planning to run this event again next year, and we'd love to make it even bigger and better! If you, or someone you know, would like to be involved in this event as a sponsor, we'd love to hear from you! We've got another giveaway starting on December 1. We're participating in the Merry Fluffy Christmas Blog Hop, and this is one of the biggest hops of the year! Every participating blog (and there are more than 50 of them!) has a cloth diaper prize worth at least $50! Watch Facebook for our announcement! Thanks to everyone for your support! It's hard to believe that in less than a year, we're inching close to 3000 fans on Facebook. Thank-you so much for your readership! We'll be announcing a 3000 Facebook Fan Giveaway soon! Did you know that long after it's impossible to get lotions and creams out of your squeeze tubes, there's still lots left? One easy way to make sure you're not wasting money on un-used product is to cut it open! As shown above, simply snip the tube open about half-way up. 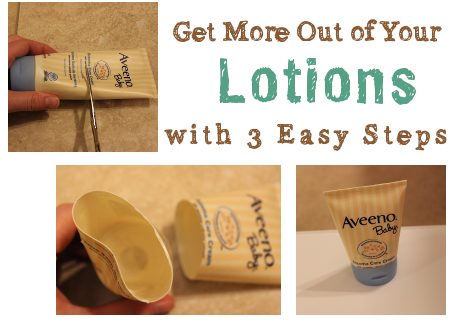 You can fit the top and bottom back together to keep the lotion from drying out before you use the cream up! Keep in touch! If you have a question, or an idea you think we should share with other busy moms in an upcoming Cloth Diaper Column, I’d love to hear from you. Feel free to drop me a line! That’s all for this month! Thanks for hanging out with me! Return to Cloth Diaper Column Back Issues.